Charles Drew was a medical doctor and surgeon remembered as the inventor of the blood bank. He also established, and was the first director of, the blood bank of the American Red Cross. Although of African-American heritage in an age of rampant racial discrimination, Drew managed to achieve an extremely high level of education (BA from Amherst in 1926, MD and Master of Surgery from McGill University in Montreal 1933, and a Doctor of Science in Medicine from Columbia University in 1940) and to become a well-respected surgeon and professor. While still at McGill University, Drew studied under anatomy instructor Dr. John Beattie who was interested in blood transfusion. Drew also had occasion, as an intern, to save a patient's life via blood transfusion. But the technology of blood transfusions was vastly limited in that up to that point, blood could only be stored for two days, because of the rapid breakdown of red blood cells. During his residency at Columbia University's Presbyterian Hospital, Drew conducted research on blood transfusions and developed a technique for the long-term preservation of blood plasma. He found that if he separated the plasma (the liquid part of blood) from the whole blood (containing the red blood cells) and then refrigerated the two separately, he could combine them up to a week later for transfusion. He also determined that while each person has a certain type of blood (A, B, AB, or O) and is therefore prevented from receiving a full blood transfusion from someone with a different blood type, everyone has the same type of plasma. Thus in certain cases it was possible to give a plasma transfusion which could be administered from anyone to anyone, regardless of blood types. Drew's discoveries, and his work in organizing and administering blood banks in Europe and the Pacific during World War II (including during the "Blood for Britain" program) saved countless lives. Furthermore, his insistence on ignoring the racial background of donors and transfusion receivers meant that non-white soldiers no longer bled to death waiting for a same-race donor to contribute blood. 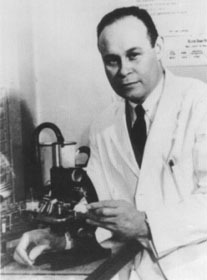 During his lifetime Charles Drew was awarded the Spingarn Medal from the National Association for the Advancement of Colored People in 1944 for his work on blood plasma. He was also the first black to be appointed an examiner by the American Board of Surgery. Drew was posthumously awarded the Distinguished Service Medal by the National Medical Association in 1950. A United States postage stamp was issued in his honor in 1981.